Lambeth 2020 – to Define ‘Anglicanism’ ? Challenges for Lambeth 2020. The end of the Anglican Communion? 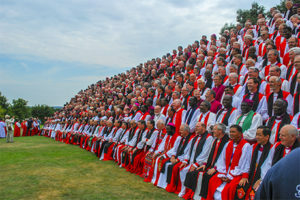 In 2020 Anglican bishops from around the world are coming to Canterbury for the great gathering of the Lambeth Conference. A lot of work is even now going on to try to make sure that this meeting is an occasion of mutual encouragement for all these bishops. It is always a positive thing if a Christian leader is allowed time out, with the opportunity to look at the Christian faith from a different cultural perspective. Our British dependence on the English language and a Western world-view through which to apprehend the Christian faith, creates a somewhat narrow perspective. African or Asian perspectives can enrich the outlook of our British bishops just as we hope that the bishops from overseas will take something of our culture back home with them. Lambeth 2020 should be an outburst of joyful celebration of this diversity of the international Anglican witness to the Christian faith. But there are various clouds that have appeared. In the first place, following the lead taken by the Archbishop of Nigeria, Nicholas Okoh, a contingent of African bishops are declining the invitation to attend. A similar boycott took place at Lambeth 2008. An alternative assembly of Anglicans gathered in Jerusalem to coincide with Lambeth and formed what came to be known as GAFCON (Global Anglican Futures Conference). This was supported by bishops from Africa and Asia and there was considerable practical and financial support from Australia and the States. One English Diocesan, the Bishop of Rochester, supported the event. The issue that was then said to be dividing Anglicans was the failure by many parts of the Communion to adhere to traditional doctrine and Scripture. This was a coded way of saying that some Anglicans did not agree with conservative perspectives on the gay issue. This has long been a key stumbling block across the Anglican world, especially since the consecration of an openly gay Bishop in the States in 2003. The issue of gay marriage is probably peripheral to the lives of most ordinary lay Anglicans, especially in places like Africa. But it has been made a cause celèbre by Christian leaders across the Anglican world because it is the chosen arena of conflict for the so-called culture wars in the States. Enormous sums of money, much of it provided by wealthy American Right-wing foundations, have been spent on convincing as many as possible across the Christian world that the gay issue is a salvation matter. In summary we could claim that the same energy that is going into supporting the dubious right-wing Christian causes backed by President Trump is being expended on undermining and dividing the Anglican Communion. Anglican leaders are constantly being pressured to agree with conservative views on Scripture. The dilemma for our Archbishop of Canterbury is acute. One line he might take is to say that Anglican Church is founded on principles that have nothing in common with the crude political theology of the American conservative Right. Anglicanism has always tolerated fundamentalism in its midst but, at the same time, it has always rejected any attempt ever to make this the compulsory option for everyone. Any Anglican appeal to Scripture has always been coupled with a balancing recourse to tradition and reason. Thus, Anglicanism is always open to newness and an evolving articulation of the Christian faith. The GAFCON conservative approach has always wanted to shut down discussion by saying that Scripture is always decisive and clear in its teaching. To deviate in any way from what the conservative leaders declare to be in Scripture is to fall into heresy and error. The matter on the agenda is at present, not the remarriage of divorced people or the ordination of women, but the single matter of gay marriage. Many liberals in the Church of England have been taken by surprise by the way that this one issue of gay marriage has come to dominate so much discussion over the past 50 years. Far from being a core topic, it simply was not even discussed when I was a student in the 60s. It might have been aired in an ethics lecture, but no one, not even among conservatives, would have elevated it to the level of a doctrine or a salvation issue. It is hard for clergy of my generation to see the debate as anything other than as an attempt by conservative Christians to create divisions as a way of obtaining dominance within the Anglican Communion. We spoke earlier of the culture wars in the States which have brought together right-wing politicians and fundamentalist Christians in a messy alliance. Happily, the conditions for such an unholy marriage do not exist in this country. Nevertheless, we still see growing confidence of conservative Christians within the Anglican Church. Trumpian politics may have indirectly seeded itself into a growing incivility in the debates between Christians. It used to be said that the Anglican Church was moving to a place of ‘good disagreement’ but this term seems to be becoming redundant. What is left is an increasingly rancorous struggle between ideologies. Lambeth 2020 is likely to be the last such conference if these wounds cannot in any way be healed. Archbishop Welby is encountering an increasingly bitter rhetoric among some members of the Anglican Communion. He faces threats to the unity of the Communion from two sides. On the one side there are the GAFCON churches of Africa, Asia, Australia and both American continents. His aides will be in constant communication with provinces and dioceses, seeking to encourage their attendance. Then there are dissident bishops and groups within the Church of England itself. We have already noted the letter from eleven bishops which was expressing an identification with the GAFCON position over gay marriage. Only four diocesans signed this letter and so it can be assumed that the majority of the English diocesan bishops still support a broader position. But the problem is not just about bishops and dioceses. GAFCON’s supporters are not to be found in particular dioceses in this country but are located in the powerful and wealthy network of individuals and parishes which count themselves as part of the organisation, REFORM. This is a very conservative bloc within the Church of England which maintains ties with a variety of non-Anglican conservative groupings which use the Anglican label. Most of the clergy in REFORM were nurtured and trained within the same theological and social networks which used to support the disgraced Christian leader, John Smyth. Welby has never been identified with a REFORM label but he will have known many of their supporters through his own Iwerne and Christian Union contacts when a student. It is in fact sometimes quite hard to see ‘clear water’ between the REFORM world typified by St Helen’s Bishopsgate and Welby’s original spiritual home of Holy Trinity Brompton. The Iwerne camps certainly seemed to have endorsed both establishments as ‘sound’ and thus suitable for their ‘campers’. Archbishop Welby is faced with a difficult problem in planning for Lambeth 2020. He is caught between two expressions of Anglicanism. The one that he has embraced since ordination is what we would describe as a flexible and even liberal version of the Anglican tradition. At the same time he is still the product of a tradition which is inflexible and strongly into intransigent Church politics. The right-wing model of politics in church and state knows only the need to dominate and control. Bodies like GAFCON want to create the whole Communion in their own image – a uniformly monochrome body, affirming the ‘unchangeable’ message of Scripture. The fundamentalism espoused by GAFCON (and the 11 bishops) cannot and will not tolerate differences. The problem for Welby is that, while he can claim to belong to a broader form of Anglicanism today, these older strands of thinking still claim part of his loyalty. His major task must be now to try and reconcile the warring factions which exist in the wider church but these rivalries also struggle inside himself. Can he provide the leadership that will hold things together? Will he be tempted to succumb to the intense lobbying and pressure from his old conservative friends? The battles being fought before and during Lambeth 2020 will define the nature of the Anglican Communion for ever. Will it become more like a conservative right-wing sect as many desire, or, will it be the place of inclusion and generosity which many of us also long for? The stakes are high, and we must pray that Archbishop Welby rises to the challenge of providing the leadership that Anglican Communion needs at this critical time. Thanks to ‘Thinking Anglicans’ for this article by Stephen Parsons. The writer, Stephen Parsons, while acknowledging the conservative Evangelical (HTB) provenance of the Archbishop of Canterbury – The Rt. Revd. Justin Welby – also points to the ABC’s openness to change in the attitude of the Church towards the LGBT+ people in the Church’s clergy and laity. In his tenure as Archbishop, Justin has proved himself to be open to a new understanding of scriptural interpretation on matters of gender and sexuality that is more in line with the proactive attitudes prevailing in the world outside of the Church – both in the social and the scientific arenas. With the rise of conservative fundamentalism – aided and abetted by the far right elements of American politics and other influences from the world of conservative religion – the Church of England, together with other Provinces of the worldwide Anglican Communion, has had to come to terms with a radically different understanding of the place of sexuality within the legitimate sphere of human thriving and wholeness. Contrary to this latter understanding, however, some Churches in Africa and Asia (and in other ex-colonial places like North America) have re-grouped into a para-Anglican rival organisation (GAFCON/FOCA) which is determined to assert a more spiritually fundamentalist position, that can be best described as ‘Sola Scripture’ – with a dependence on Scripture alone as the sole arbiter of how human life is conditioned to behave in a still-evolving creation. However, scientific observation methods have grown exponentially since the days when the Judaeo-Christian Scriptures were first written. Modern cosmology, for example, has exponentially superceded the original biblical world-view of a 3-tier universe – with earth at the centre. Also, in the ethical arena, we have progressed from the era of the culture of slavery and female subordination – to the more humane understanding where patriarchal privilege is recognised as being out of kilter with the tenets of the Gospel, which ushered in a more Christ-like understanding of a need for justice and equality. The FACT that members of the LGBT+ community have now been discovered to be a minority sector of the Body of Christ (whether recognised as such or not) has been more readily accepted by the more open-to-the-world religious communities – including the hierarchy of the Church of England – should not be too surprising. The world of socio-scientific research has made important new discoveries in the areas of gender and sexual evolution in both the human and the animal species, which have overturned age-old shibboleths of excessive puritanical sexism and homophobia that have long inhibited humanity against a proper understanding of creation’s ongoing evolution from its first beginnings. What is being discovered by the Church Universal is that the Holy Spirit is still engaged in the task of teaching & enlightenment that Jesus promised would be duly inaugurated on the First Day of Pentecost – all with the explicit purpose of revealing the purposes of God at work in ALL creation. Our fullest human thriving in relationship to Christ and one another is part of that process. Thanks be to God!